I’ve written before on the topic of vol drag; mainly why I like to take advantage of the concept in a long-term trading strategy. In summary, volatility drag provides a nice tail wind for going short the leveraged ETF (the risk of the underlying can be hedged away using the unleveraged ETF, as well). It seems that this concept is one of the more popular posts on my blog. I’m not exactly sure why, but hopefully it’s from people who either stop using levered ETF longs to achieve portfolio diversification (e.g. using a long 2x/3x S&P ETF for long-term equity exposure), or from folks looking to use shorting strategies (e.g. long puts, short call spreads, short stock) to capitalise on vol drag itself. I like to combine these two: for example, I’ll get most of my US Treasury exposure through writing synthetic covered puts on TBT. That way I pocket vol drag on top of Treasury yields. 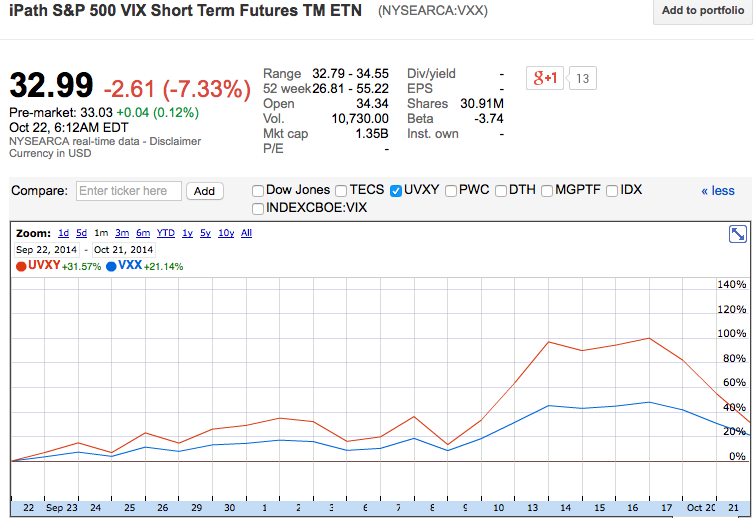 For those new to this: VXX tracks changes in the VIX index, by buying short-term VIX futures. UVXY is meant to return 2x the daily return of VXX; again, this is achieved by buying (I’m guessing double) the same futures. Because VIX futures tend to be in contango, buying futures is a generally losing proposition unless volatility is spiking (e.g. the past month). Because geometric returns (which is the price series of UVXY) are generally lower than arithmetic returns (which is each day’s return of UVXY versus VXX), the former’s price series should lag the 2x mark. So what’s happened over the past month: VXX up 21%, UVXY up 31%. Total drag of about 10% in a month. On a side note, look how vol drag can work in UVXY’s favour. When the VIX was increasing just about every day (e.g. beginning of period until 13 Oct), geometric returns were higher than arithmetic due to compounding. At the peak, end-13 Oct, gains in VXX and UVXY were 45% and 97%, respectively. It was only when volatility really came off that the effects of vol drag become obvious. The impact of VIX futures in backwardation also was a positive for UVXY vs VXX for the period, but that’s another conversation.